You can lose and find yourself in Australia's Red Centre, a place rich in Aboriginal culture and rugged outback beauty. You'll also find the sacred and natural wonders of Uluru(the heart of the outback beats. ), Kata Tjuta, the MacDonnell Ranges and Kings Canyon. The Stuart Highway is bitumen all the way since 1980 and intersects interesting towns like Woomera, Coober Pedy, Alice Springs and Katherine. Long distance between each Service station, the most of them is Glendembo to Coober Pedy, 254 km. Ride on a push bike with Martin from Adelaide to Darwin. But... Martin have opportunities to save a lots of miles if he will take a plane in France Soon. 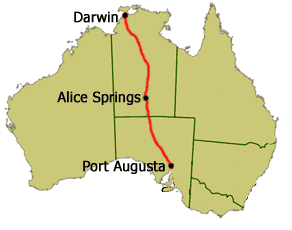 His time become limited and we got 3 or 4 weeks to ride on the Stuart Highway with no experience. Finally, after 3 days, Arrived in Port Augusta, I realize that we take the same road but not the same purpose. I would like Explore the Stuart Highway, take detours, avail of the opportunities, take days off for take rest and learn the history of the places, make meetings, take my time for enjoy each day. Then, I tell him " keep going without me, I need to stay here one day and take rest before to keep going." I become alone and was not sure to keep going by my self. Apprehensive, I gone to the library and use the internet for tell my situation and looking for someone to join me. But I cant wait that someone join me for continue my travel so I decided to continue by my self and was the best decision for got the most freedom. "Go where I want, when I want, in my rhythm." "My journey is not to go to Darwin, but it ends in Darwin"
I discover this passion for travel by bicycle, and I think to do the tour of Australia after arrival in Darwin. One day, a trip by bicycle tandem. Traveling by bicycle with many people. Ton projet est génial ! C'est vraiment magnifique ! Je te souhaite bon courage, beaucoup de bonheur et de belles rencontres !